Boral Roofing is nation’s largest manufacturer of clay and concrete roof tile. Known as the leader in roof tile innovation, The Gemstone Collection was designed to impact the competitive California architect and colorist market. Long known as an innovator, they wanted their new Gem Collection to capture the imagination of the building and architectural industry. Architects are major influencers in the determination of all the major building components, including roof tiles. To distinguish this line from other competitors, Boral turned to Westamerica to help create a display system that would present the new tile collection in a professional and compelling manner. Westamerica packaging engineers and support personnel worked through multiple prototypes and finally landed on a solution that met all of the client’s objectives while staying friendly to the manufacturing process and keeping costs low. 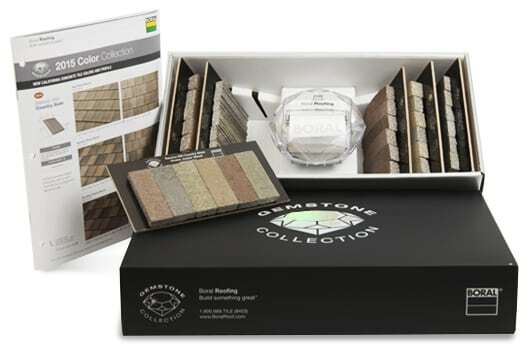 The clever box design allowed Boral to feature the Gem Collection’s sophisticated color blends, incorporating hues originating from and inspired by the Southwest. We also included a premium – a giant branded sticky note dispenser – to remind the recipient of the new collection throughout the year. The client wanted a striking logo treatment to reflect the high-end nature of the product, so Westamerica recommended a holographic treatment. Extensive testing of alternatives took place before finally coming up with the best outcome. 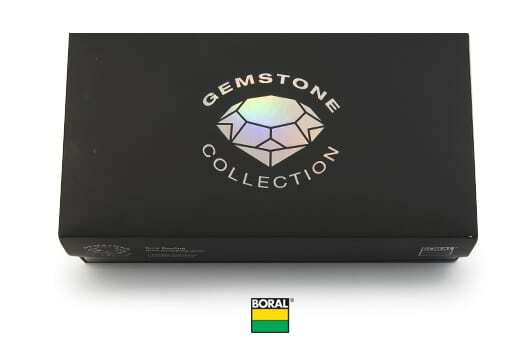 Boral’s field and support staff have found the Gemstone Collection to be very helpful in carving out additional awareness among their influencers and use the material extensively.